In 1988 director Cynthia Beatt and the Tilda Swinton embarked on a filmic journey along the Berlin Wall to create the short film CYCLING THE FRAME (28', color, 1988). Riding her bicycle from the Brandenburg Gate to the suburbs, passying by lakes, fields, and checkpoints, Swinton retraced the concrete and oppressive structure encircling West Berlin, cutting through neighborhoods and buildings, seeming indestructible at the time. One year after filming, the Wall was opened and the process of reunification of Germany began. More than 20 years later, in 2009, Beatt and Swinton reteamed and retraced their ride, but this time weaving through both sides of the fallen wall. THE INVISIBLE FRAME (60', color, 2009) depicts this poetic passage and reflects on history, memory and freedom. Swinton's reactions and inner monologues, enriched with texts by Stevenson, Yeats and Akhmatova, and a soundscape by Simon Fisher Turner, create a deeply engaging and personal vision. Together these films offer a fascinating journey through time and bring a poetic and meditative view on one of the most important events of the 20th century. Bonus Features include an essay about the project by filmmaker Cynthia Beatt, and a photo gallery. A multi-faceted portrait of artist, philosopher, writer, storyteller and "radical humanist" John Berger. 2010 Academy Award Nominee, Best Documentary Short Subject. The history of the Berlin Wall from the rabbits' point-of-view. 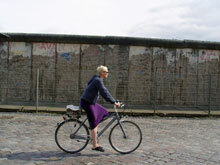 A quirky 1988 documentary in which Tilda Swinton tours the circumference of the Berlin Wall on a bicycle.